When I look at most of my holiday dinners, many are of the meat and potato variety. (OK, there’s more likely to be pasta or polenta on the table but they do start with a “p” and that should qualify them.) Up until several years ago, those potatoes were either mashed or baked au gratin. That’s when I decided enough with the plain potatoes. Sorry, Idaho. Bring on the sweet potatoes! Initially, I made them as I would my potatoes au gratin: with milk, Swiss cheese, and a little butter. Over time, I swapped out some of the ingredients and in the process these potatoes earned a standing invite to my holiday tables. The recipe below is the latest version. Earlier editions included pancetta, bacon, garlic, and/or nutmeg. Although I liked each, the individual flavors worked better with normal potatoes, their flavors being a bit too much for the sweet potatoes. You may feel that way about the onions used here. If too much for your tastes, substitute diced shallots in their place. One more thing to remember. Do not bring these potatoes from the oven directly to the table for serving. They really do need to sit for no fewer than 10 minutes — 15 is better — so that they set. You want to serve creamy potatoes not a runny mess. Use cooking spray or a tab of butter to liberally grease an oven-proof baking dish. 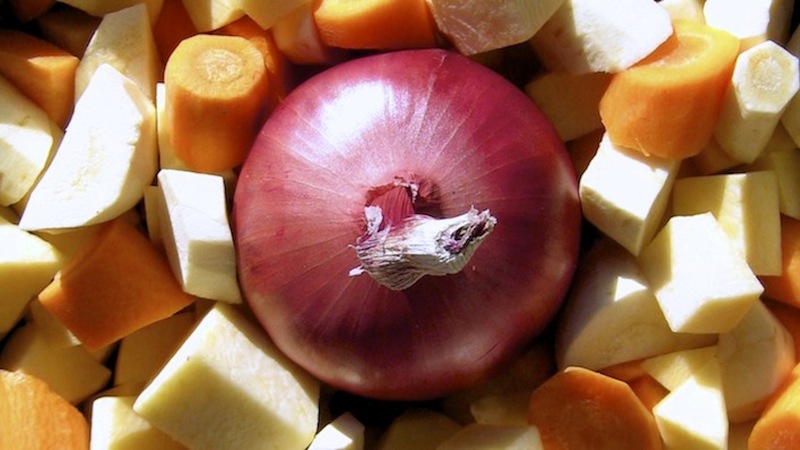 Cover that layer with 1/2 of the sliced onion. Use 1/3 of the grated Gruyère to cover the onions and potatoes. Repeat steps 4, 5, and 6. using all the remaining onion in the process. Use the last of the sweet potatoes to cover the dish’s contents. Stir the cream slurry before pouring it evenly over the top of the dish. Cover the dish with the remaining Gruyère. Dot the surface with the butter pieces. Sprinkle the grated Parmigiano Reggiano to evenly cover the entire dish. Bake in a pre-heated oven for 45 to 50 minutes or until the potatoes are nicely browned. Allow to rest at least 10 minutes before serving. I used a 9 inch (23 cm) square baking dish and the potatoes weren’t sliced too thinly. (.15 inches, 4 mm). More or less of the posted ingredients may be needed if the size of your baking dish differs appreciably from the one used here. The recipe, as written, is gluten-free. If you haven’t arrowroot but wish to keep it GF, add an equal amount of cornstarch into the cream. Of course, if you and your guests have no issues with gluten, flour can be used as the thickening agent. WIth its heavy cream, butter, and cheeses, this is not a low-calorie dish. (That’s why I only serve it on special occasions and holidays.) If you’re looking for something a little more waist and heart-friendly, hop on over to Fanny Reggiori’s blog, foodidies, where she recently posted a delicious, lighter sweet potato au gratin recipe. No matter the recipe you choose to prepare, you really cannot go wrong. Since we’re talking healthy, which do you think is healthier, baking potatoes or sweet? Click HERE to find out. And if that kind of info floats you boat, go HERE to see a list of similar comparisons. Some of the results may surprise you. Since we’re talking holidays, here’s a look back at the method I use to prepare standing rib roast every New Year’s Day. You can catch a glimpse of one in the first photo of this post.) It’s easy to prepare but much depends upon aging the roast in your fridge before cooking it. Interested? You can learn all about it HERE. It all started innocently enough, with a blossom identical to the one pictured above. I had learned my lesson well, or so I thought. See, last year’s 2 eggplants were just about smothered by my tomato plants. The tomatoes quite literally took over my then-new raised garden bed as if the soil had been smuggled out of Chernobyl. I picked only 1 eggplant and it was a Japanese variety, not at all what I had expected. This type of thing has happened enough times to convince me that there are people who delight in swapping name tags between differing varieties of the same vegetable. This spring’s cuckoo was a jalapeño masquerading as a cayenne pepper. This year, I planted 3 eggplants with the conviction that I would keep my eye — and pruning shears — on the neighboring tomato plants. I won’t bore you with the details but I was partly successful, with two plants growing nicely. The 3rd, well, is now engulfed. All facts considered, I really cannot complain. The 2 remaining plants have managed to produce more of the bulb-shaped vegetables than I thought botanically possible. (I really must get that soil tested.) As a result, I’ve pulled out every eggplant recipe at my disposal in trying to stay ahead of these 2 overly productive plants. Here are the dishes that I’ve prepared thus far. I’ve supplied the recipe for the first dish and links for the rest, the exceptions being the eggplant lasagna and a pickled eggplant. Both of those recipes are in the works. Pre-heat the barbecue or grill pan. Slice the eggplant into approximately 3/4 inch (2 cm) rings. Cut the plum tomatoes in half, removing the seeds if you like. Use a pastry brush to sparingly coat the eggplant with olive oil. Lightly drizzle the tomato halves with olive oil and then season everything with salt and pepper. Giving the eggplant slices a head start, grill both vegetables until cooked to your satisfaction. Remove to a platter. Garnish the vegetables with a mixture of chopped fresh rosemary, thyme, basil, and parsley. Season with salt & pepper before adding a drizzle of extra virgin olive oil or Olio Santo (See Coming soon … ). This vegetarian dish may be served hot, warm, or at room temperature, and will make a great light lunch or tasty side for any meal. A favorite of Sicily, this eggplant & tomato sauce was created in honor of the Bellini opera of the same name. You needn’t travel to Sicily nor the nearest opera house to enjoy this dish, however. Just take this LINK to see the recipe that I posted. The recipe calls for a garnish of ricotta salata. If you cannot find this cheese, crumbled feta is a great substitute and more readily available. Also originating in Sicily, caponata is another dish that celebrates the eggplant. 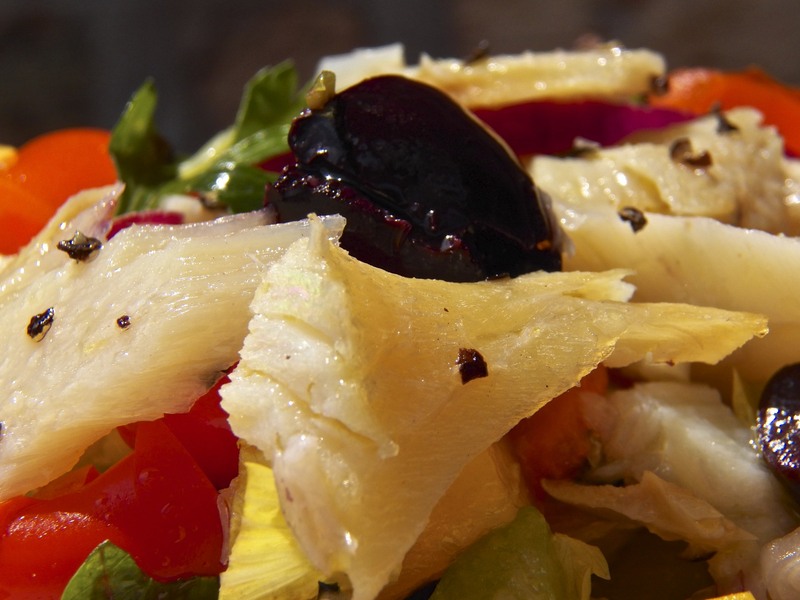 Today, it is found throughout Italy with ingredients that often vary from region to region. I’ve shared Mom’s recipe, which you can find HERE. Don’t forget to make more than needed. Add a few beaten eggs to the leftovers to make a tasty frittata the next day. Grandma served this dish to her girls, Mom & Zia, when they were young. You can well-imagine my surprise when my Zia in San Marino also served stuffed eggplant during my recent visit. The recipe for this tasty contorno — and popular in both sides of my family — can be found HERE. Any of the stuffed vegetables in the linked recipe can be used to make a great tasting sandwich for your lunch the following day. A layered dish, eggplant lasagna features pasta sheets, baked eggplant slices, and a tomato sauce, with or without meat. Oh! I almost forgot the cheeses. Asiago, mozzarella, and Pecorino Romano combine to make this one flavorful main course. True confession time: I had thought that I’d already published this recipe and was surprised to learn that I had yet to share it. Not to worry. That oversight will be corrected in the weeks to come. Jamie has done it again. In his recipe, eggplant is chopped, bathed in a pickling liquid, and then marinated in herbed olive oil. Best of all, this same technique may be used with mushrooms, onions, small peppers, zucchini, and fennel, with each vegetable having its own suggested herb to include. You can check them all out by taking this LINK. I did make one substitution to his recipe. In place of oregano, I used marjoram. For those unfamiliar, marjoram is related to oregano but is a bit more mild and is favored in Le Marche, the ancestral home of the Bartolini. Looking for something with a bit more heat? Well, with my cayenne pepper plants competing with my eggplants for top honors, I went web surfing for recipes. With many to choose from, the final recipe is an amalgam, using ingredients that I had on-hand or that could be easily sourced. The result was a spicy dish that I really enjoy. Best of all, it’s reduced my eggplant AND cayenne pepper inventories. A bit too involved to be shared here — this post is long enough already — I’ll publish the final recipe in the weeks ahead. This eggplant dish supplies the heat that Jamie’s pickle was missing. Can you detect which has been garnished with a drizzle of Olio Santo? Although I’ve enjoyed baba ganouj far too many times to count, I’ve never actually prepared it, relying instead on one that I purchase from my favorite Middle Eastern grocery. Well, with a glut of eggplant filling my vegetable crisper, baba ganouj seemed like yet another great use of the melanzane and I sought help from the blog of our resident Middle Eastern food expert Sawsan, The Chef in Disguise. Her blog is brimming with delicious recipes and you can view her baba ganouj recipe HERE. And there you have it. This is my way of handling 2 incredibly productive eggplants. If you think I’ve eaten plenty of eggplant lately, well, you’d be correct — and you haven’t even seen the inside of my freezers. I’ll be enjoying(?) eggplant dishes for months to come. If I’ve missed an eggplant dish that you’re particularly fond of, or, you prepare a tasty variation of one of the recipes that I’ve just highlighted, don’t be shy. Please share the recipe or link in the Comments section below. These plants just won’t quit! … My recent absence from the blogging world. This is Honey Time in Michigan’s Thumb and my Cousin and his Wife graciously offered to open Zia’s home so that I could get honey for my friends and neighbors. That’s the official explanation. 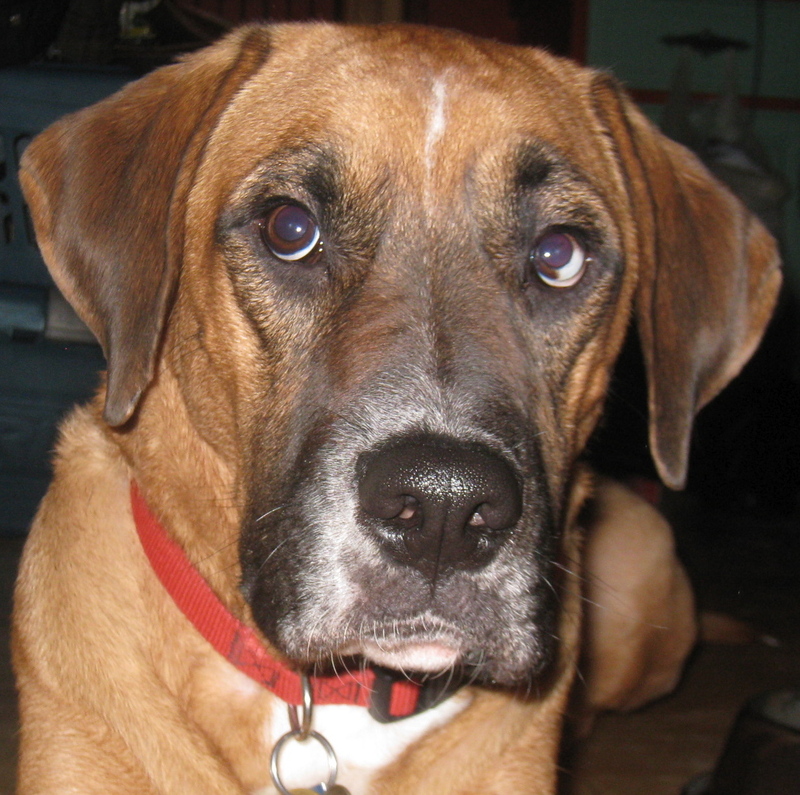 In reality, my Cousin – aka “The Max Whisperer” – hadn’t seen Max in about a year and missed their “nature hikes”. In the photo above, the 2 BFFs are returning from their last hike of the visit. Also above is a photo of 2 of the 3 cases of the honey that I brought back. All told, our little group of honeycombers purchased about 6 cases of honey that day. As luck would have it, my Cousin found a baseball-sized puffball growing in the yard. When picked 3 days later, it had grown to the size of a cantaloupe. As of this writing, I’ve yet to prepare it — but I will! Eggplant parmesan is the one dish in my repertoire that I’ve yet to prepare using the current harvest. Having made 2 trays of eggplant lasagna – one of which is still in my freezer – I took a pass on eggplant parmesan. Who knows? If we don’t have a killing frost soon, I just may turn to eggplant parmesan to help me deal with this surplus. Worse things could happen. You can see the recipe that I’ll be following simply by clicking HERE. There’s a storm-a-comin’! Grab the … lentils? This time around, I found myself in a grocery on Thursday, two days before the first great snow of the year was to hit. I bought my regular items without giving the forecasts a second thought. At one point, I was in the bulk food area looking for seeds for Lucy, my parrot, when I stumbled upon French green lentils. (These aren’t Puy lentils but I’ll take what I can get.) I bought some thinking that one day I’d use them to prepare and blog about my family’s method of cooking lentils. That was the plan. Come Saturday morning, the storm was hitting the southern part of Illinois and headed for Chicago. Forecasts were now saying we’d get 5 or 6 inches before the storm passed on. This usually means that I would be spending an hour or so clearing snow from my walk, as well as those of my neighbors. (They’re all retirees and I hate to see them out there, shovel in hand, clearing their walks.) I remembered how nice it is to come into my kitchen, having just finished my snow removal duties, and smelling a pot of soup on the stove. That’s it. I’d make a pot of soup. Well, apparently, I had used the last of the chicken stock the week before when I made risotto. Worse, I’d used the last of the chicken bones, along with my vegetable clippings, to make that stock. I was just about to give up the idea of making soup when I saw the lentils on my countertop. This will work. The ingredients for today’s recipe were all in supply in my kitchen, except for the thyme. I thought of that when I went into the yard to make sure everything was stored before the big storm arrived. As luck would have it, the vegetable stock was ready and although there was rain, there was no snow. I waited a couple of hours and still no snow. I went ahead and cooked the lentils — still no snow. I ate my dinner and eventually about an inch of snow fell, none of which “stuck” to the walks. All told, it was a pretty good day: my home carried the aroma of stock simmering on the stove; I enjoyed a comforting lentil dinner; and, I didn’t need to go out and deal with any snow whatsoever. May our weather men’s predictions for snow always fall short, just as they did that Saturday afternoon. Pick through the lentils removing any small pebbles or grit that you may find. Rinse them under cold running water. Drain. Place the lentils in a medium sauce pan and cover with 1 quart (950 ml) of vegetable stock. Bring to a boil over med-high heat before lowing to a soft simmer. Meanwhile, place the sausage meat into a frying pan over med-high heat. As it cooks, use a wooden spoon to break up the meat into small pieces. After about 5 minutes, add the onion, carrot, and celery. You may need to add a bit more oil to moisten the pan. Continue to sauté until the vegetables are cooked but still al dente – about 7 to 10 minutes. Add the garlic and optional red pepper flakes. Continue cooking for another minute. Add the tomatoes, 1 cup of vegetable stock, and the thyme, if using. Stir to combine. Bring to a boil and then reduce to a simmer. As the lentils cook, use a large spoon to remove any foam that may surface in the liquid. After simmering for 30 minutes, clear the remaining foam from the surface and pour the lentils and liquid into the pot with the tomato sauce. Bring to a boil before covering and reducing to a simmer. After 15 minutes, check the lentils. If too dry, add more vegetable stock. If too soupy, keep uncovered and allow some of the excess liquid to boil off. The dish is ready when the lentils are cooked and the consistency you prefer. Serve immediately and if I’m seated at the table, have some grated Pecorino Romano nearby. No need to run to a store to buy vegetable stock. Into a medium size sauce pan, place one quartered onion, 2 roughly chopped celery stalks, 2 roughly chopped carrots, a few parsley stems, 2 smashed garlic cloves, and a quartered tomato or 1 – 2 tbsp tomato paste. Fill with water, bring to a boil, and then lower to a soft simmer. Continue to cook for 90 minutes to 2 hours. Season lightly with salt and pepper before straining the vegetables. You will easily have enough stock for this recipe. Refrigerate whatever stock is left over. Before bringing to the table, add as much stock as you prefer. This can be served relatively dry or with enough stock to resemble a soup. You may notice that leftover lentils will absorb whatever stock is left in the bowl. Use the refrigerated stock to moisten the lentils when you reheat them. What’s this? More bad weather on the way? While this recipe sat innocently in the queue waiting to be posted, an arctic blast descended upon sweet home Chicago. As luck would have it, I had just bought ham hocks at the grocery the day before. So, as the temperatures dropped, there was a pot of vegetable stock simmering on the stove, to be replaced by a pot of lentils later in the day. This time, however, with its use of ham hocks, the recipe is the same as the one prepared by my family years ago. Comfort and nostalgia served in one bowl. As was implied above, our current weather means it’s time for soup. With that in mind, I’m sending you back to Mom’s broth recipe, her brodo. That one pot of stock would be used to make noodle soup, risotto, gravies, and, of course, to soothe our upset tummies. You can learn all about this wonder broth by clicking HERE. 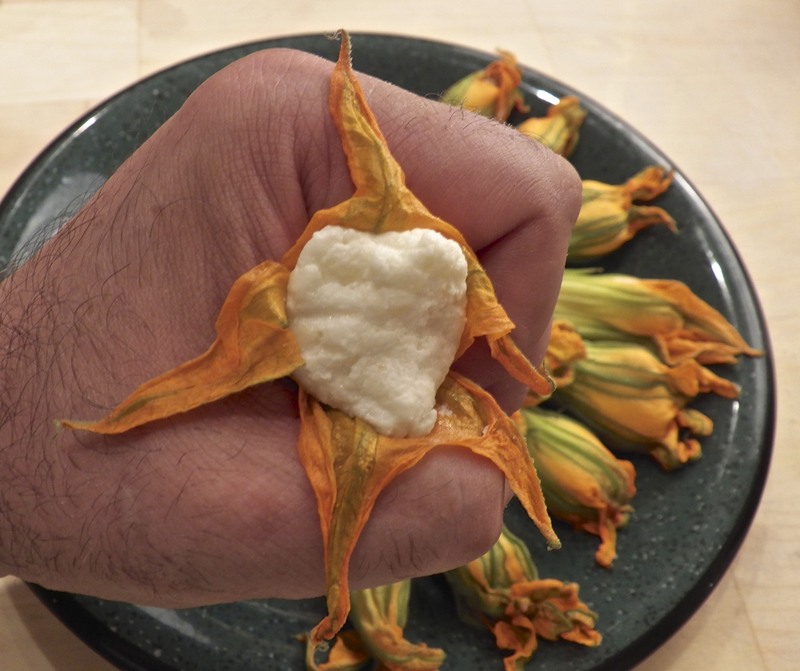 For a number of years now, it seems that every cook and chef on television has demonstrated the fine art of stuffing zucchini/squash blossoms before being fried. This was not something we ever tried at the two-flat. First of all, Grandpa would never plant something in his garden that would take up so much space. Tomatoes were his main interest and a plant that sprawled, no matter what kind, just wasn’t welcome. More importantly, even if he found a suitable spot for, say, zucchini, picking the blossoms would not have been acceptable to him in the slightest. He planted zucchini and anything that would lessen the crop would not have been allowed. 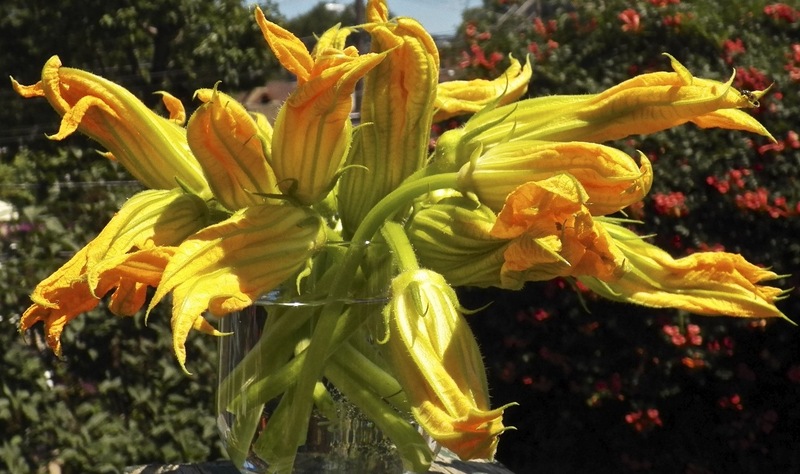 So, without the crutch of a family recipe, I headed into new territory when I bought my first bunch of zucchini blossoms late last Summer. Those first blossoms proved to be a disaster. They were an impulse buy and I’d no idea how to store them, so, I treated them like I would cut flowers. I awoke the next morning to find a wilted mess in a glass of water. That was the last I saw of blossoms until a few weeks ago, when I came across some at the farmers market. With my car in the shop, they survived the trip home in surprisingly good shape. Problems arose, however, when it came to creating a stuffing. Not wishing to test the CTA’s reliability a 2nd time that day, I raided the fridge, finding fresh mozzarella and fontinella cheeses. A quick trip to the corner store and I returned with a 1/2 gallon of whole milk that was used to make ricotta. These three cheeses were used to prepare the stuffing used in today’s recipe. With the stuffing decided, I set about creating a batter to coat them. I tried a number of versions, over the course of 3 Saturdays, finally settling on a batter of flour, corn starch, cornmeal, and club soda. This batter was, by far, the best, resulting in blossoms that were crispy without being buried in batter. I also continued to experiment with fillings. My favorite consisted of mozzarella and anchovies. Unfortunately, my photos from that batch were a mess, though I did post the “best” one later in this post. I’ll be leaving for Michigan and the Kitchens will be closed as a result. It’s time for a little R&R on the beach with Max. See you in 2 weeks. Using tweezers, remove stamen and gently wash each blossom. Carefully blot each one dry. Remove the stems just beneath the blossom. Place a coffee filter into a strainer and add ricotta. Allow to drain a couple of hours. Discard the liquid (whey) and reserve the ricotta. 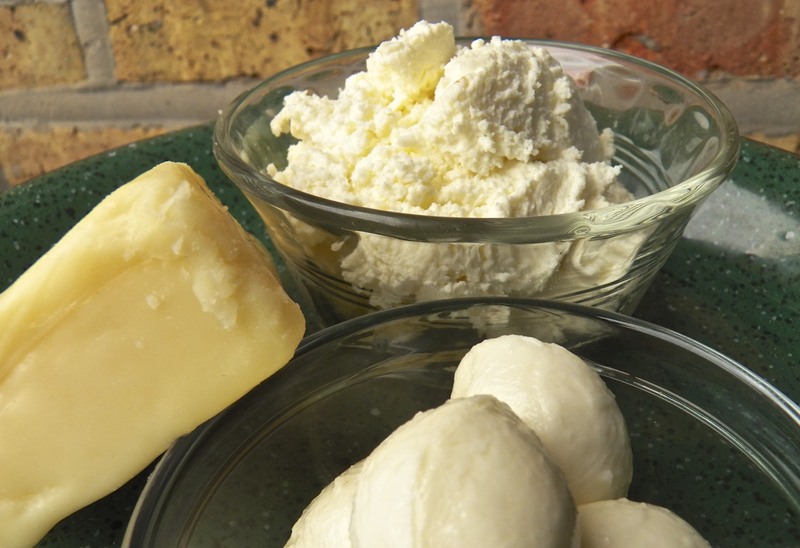 Combine ricotta, mozzarella, and fontinella cheeses. Mix well. Add flour, corn starch, salt & pepper into a bowl and whisk to combine. Add enough club soda to make a batter. Place the cheese mixture into a pastry bag or plastic storage bag. If using the latter, cut off one of the bag’s bottom corners and force the cheese into that part of the bag. Grab hold of a blossom in one hand and gently separate the petals to reveal a “pocket”. Gently blowing into the blossom may help open it up. Place the tip of the cheese-filled pasty/plastic bag into the pocket and squeeze some of the cheese into the blossom. Do not overfill nor allow the blossom to split. Continue until all are stuffed. Fill a medium-sized sauce pan with about 2 inches (5 cm) of oil. Heat to about 350˚. You’ll know it is hot enough if a bit of batter instantly begins to fry when dropped into the hot oil. Take one blossom and twist the petal ends to seal the cheese inside. Grabbing hold of the twisted petal ends, dip the blossom into the batter to cover. Drain excess batter and then place in the hot oil. Continue with more blossoms. Work in batches to avoid overcrowding the pan. Remove to a paper towel lined dish and season with salt. 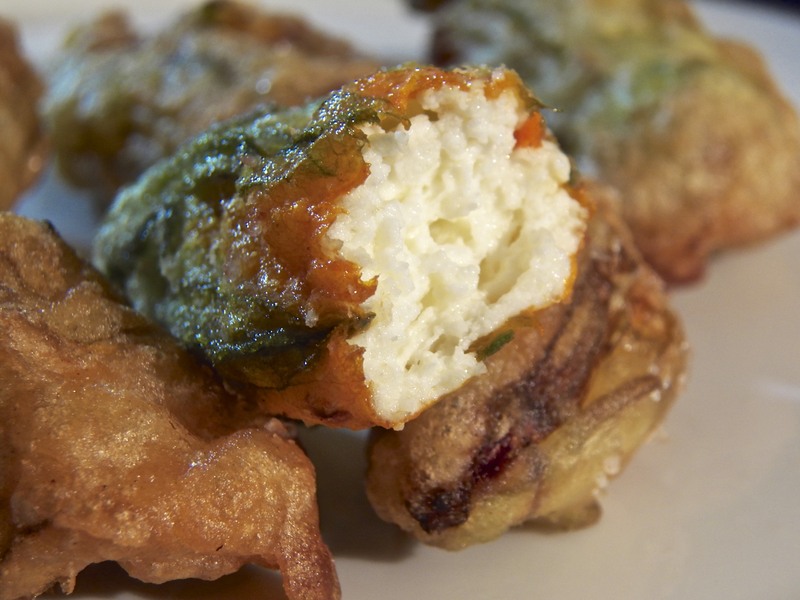 Though stuffed blossoms are wonderful when fried, you really don’t need to stuff them with anything before frying. Just dip them in the batter and fry them. You’ll get a light, crispy treat without the hassle of trying to fill blossoms with cheese. You can stuff the blossoms with whatever you like. Any cheese or mixture of cheeses will work. I chose a combination of 3 cheese for this post. My favorites, though were blossoms stuffed with mozzarella and an anchovy. Simply prepare the blossom as indicated above, cut a stick of mozzarella, wrap it with an anchovy, insert both into the blossom before dredging and frying. Unfortunately, the photo on the right is the best of those I took that afternoon. There are several ways to coat your blossoms. Some prefer to use eggs in their batter while others “go it alone” with just a coating of flour. Some use breadcrumbs to form a coating and others like only flour. I like a thinner batter, so, I use a little club soda poured into a mixture of 1 part each of corn meal and corn starch/flour for every 2 parts AP flour. When mixed, I prefer a batter that’s a little thicker than buttermilk but not quite as thick as pancake batter. I’ve yet to discover a good way to store blossoms. I was told to treat them like freshly cut flowers and that didn’t work. I’ve since searched the web and it’s suggested that the blossoms be tightly sealed and refrigerated. (One of the vendors expressly stated not to refrigerate them.) I’ve yet to try this for when I returned last weekend for more blossoms, none were to be found — hence the blurry photo above. By far, the easiest way to stuff a blossom is to use a pastry or plastic bag, tip inserted into the blossom. If and when I find more blossoms, I think I’ll try the 3 cheeses again, only doubling the amount of mozzarella and fontinella before adding chopped anchovies to the mixture. Yes, I do love my anchovies! Whenever soft cheeses like mozzarella need to be grated, it’s easiest if your place the cheese in the freezer for about 30 minutes beforehand. This should harden the cheese a bit, making grating a snap. Initially, I tried a shallow fry, using about a half-inch of oil in the pan. I did not like the results at all. The lack of oil meant the blossoms had to be “handled” more so that they could be flipped and evenly fried. This raised the risk of damaged blossoms and leaking cheese. Using about 2 inches (5 cm) of oil made frying so much easier and consequently no blossoms were harmed in the making of this tasty treat. For many, a meal isn’t complete until coffee and an after-dinner liqueur are served. If that meal is served during the Summer, a dish of ice cream is very often part of the equation . 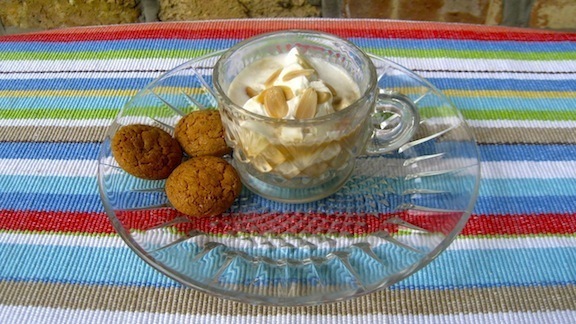 With an eye towards reducing the average dishwasher’s workload, the Italians took these 3 traditions and united them in one simple dessert, affogato al caffè. Often served in a cup, affogato is a combination of ice cream and espresso, with an optional shot of your favorite liqueur. I think you’ll agree that an affogato is a wonderful way to end a meal — without having to loosen your belt afterward. You can see directions for creating a variety of affogati by clicking HERE. Oh, don’t worry. I’ll explain the title in a minute. The 1990s was my decade for travel. Accompanied with my best friend, aka my Traveling Companion, we toured places that I had previously dreamt of visiting but never thought that I’d actually see in person. One such place was Greece. We arrived in Athens, spent the night, and then headed out into the Aegean for some island hopping. This trip had a little something for everyone: a modern-day metropolis; ruins of ancient civilizations; beautiful beaches; thriving nightlife; far too many picturesque settings to mention here; and the food. Oh, the glorious food! As you know, my love of pasta knows no bounds, so, you can rest assured I had my fair share of pastitsio, with a little moussaka thrown in for good measure. Surely, my holiday in Greece would not have been complete unless I had my fill of lamb nor, for that matter, could I be expected to go from island to island without at least sampling the seafood — repeatedly. And I can assure you that any gyros bought from any street vendor anywhere on those islands will put to shame any gyros you can buy on this side of the Atlantic, hands down. Even so, Man does not munch on gyros alone and, since each island has its own wine, cheeses, olives, & olive oil, it would have been an insult had we not tasted them all, usually with a chunk of crusty bread. 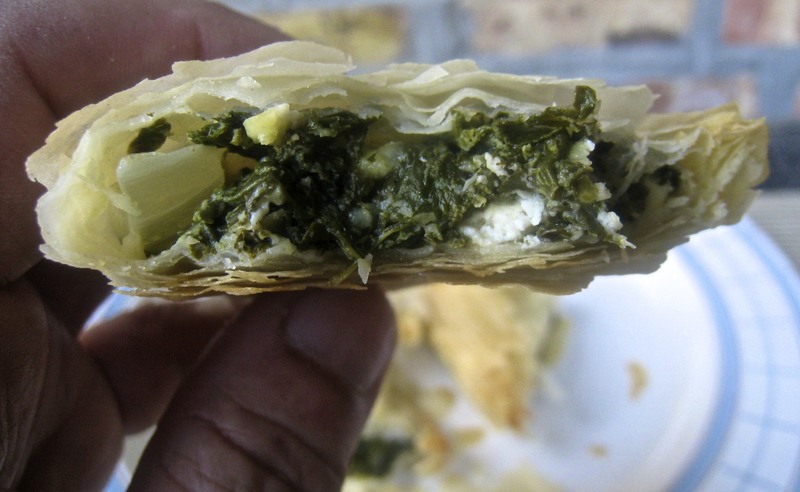 Similarly, it was a surprise to learn that each island also prepared its own version of spanakópita, the Greek spinach pie. 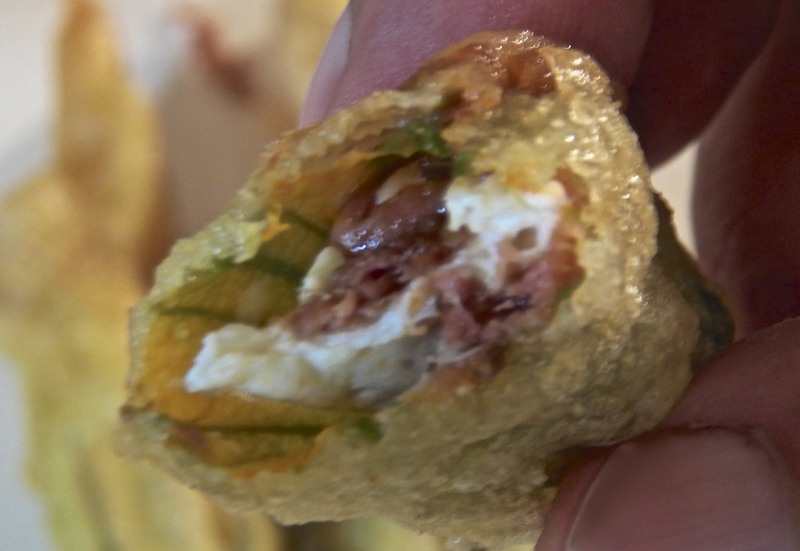 Now, I truly enjoy spinach pies and my family makes the Italian version of these tasty treats. (Called cacioni, you can see our recipe here and a recipe link supplied by my blogging friend from Le Marche, Mariano Pallottini, can be found here.) So, I needed no further encouragement to taste each island’s unique take on spanakópita. I soon learned that although the basics to each were the same (a spinach filling covered with phyllo dough) there was a surprising variety. First off, some spanakópita were actually pies and each serving is a wedge just as if it were some fruit-filled dessert. Others were prepared on baking sheets and you’re served a rectangular piece like you would if it were baklava, only larger. Still others were prepared with individual servings in mind and could be self-contained, triangular or burrito-shaped pies. Beyond their form, the stuffing mixtures contained primarily the same ingredients but in differing proportions. Virtually all contained spinach, a little onion, lemon (either zest, juice, or both), dill, and a binding agent, eggs I presume. As you can well imagine, changing the amount of lemon zest or dill to be used can greatly affect the overall taste of the pie. In some cases, a little mint or parsley was also added to the filling, each adding their own distinct flavor to the mix. So, with so many variables at play, I never knew what I would be served when I choose spanakópita from a menu — and I enjoyed the surprise almost as much as the pie. Normally, this is where I’d dive into the recipe but one more thing needs mentioning. One night, while on Mykonos, we asked our hotel proprietor for a local restaurant, a taberna, far from the tourist crowds. He obliged, sending us to a great little spot where, coincidentally, a family group was holding some sort of celebration, as I recall. It’s been some time since that evening and I’ve grown unsure of many of the specifics but I do remember 3 things: 1) we were sent ouzo shots from the management and the celebrants; 2) we ordered the house specialty, gardoubes, lamb offal that’s wrapped in caul fat and grilled; and, 3) we were sent ouzo shots from the management and celebrants. What does any of this have to do with spanakópita? Well, I was so impressed with the dish — or, in retrospect, was it the ouzo? — that I was determined to find out how to prepare it. To that end, I eventually located a cookbook that contained a recipe for a version of gardoubes and I immediately ordered it, sight unseen. Sadly, it was a bit of a disappointment. Originally written in Greek, the translation was apparently word-for-word, without considering context, rendering parts of some recipes nonsensical. Gardoubes was one of them. I decided that I wasn’t meant to make gardoubes and moved onto other things — but I kept the cookbook. Move ahead now, to a couple of weeks ago. I had just posted my instructions for making feta cheese and I had a fridge full of jars containing feta in brine. Growing tired of Greek salads, I decided to make spanakópita with feta added to the filling. Thus began the Great Search of 2012. I’d not seen, let alone used, that recipe in years. More notes than formal recipe, I had scribbled them on a piece of paper as I watched a Greek woman prepare spanakópita on a cooking show, most probably broadcast on PBS. Well, midway into my search, I located the long-forgotten cookbook. I thought I had hit pay dirt. Why look any further when I had the “real deal” right here? Guess again. Its version of spanakópita was of the pie variety and didn’t contain any cheese. 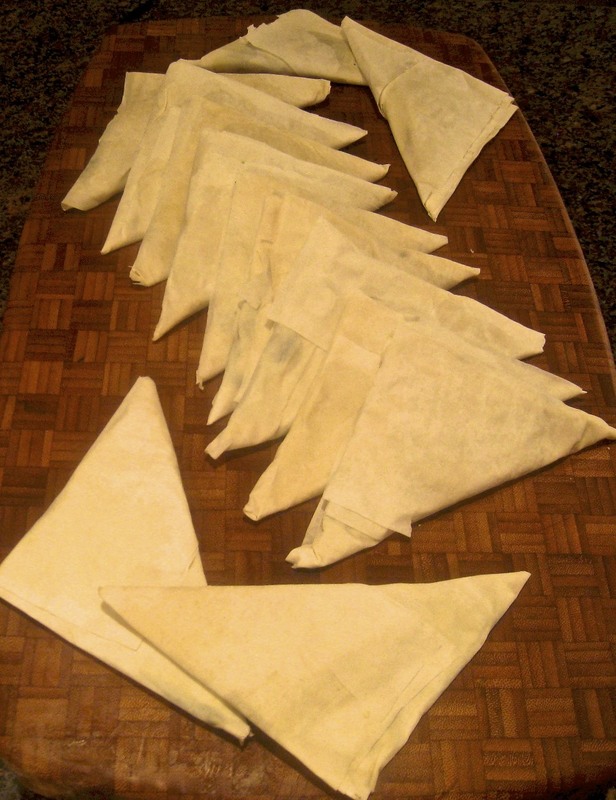 It did include a recipe for triangular-shaped pies but these were filled with cheese and called tyropitákia. They even had a lovely photo of the little triangles, so golden-brown and enticing. Also pictured with the tyropitákia was a platter of “cigars” that were phyllo dough wrapped around a filling of what looked to be spinach and cheese. In the caption, they were identified as spanakotyropitákia. What luck! I found exactly what I needed — except that I didn’t. 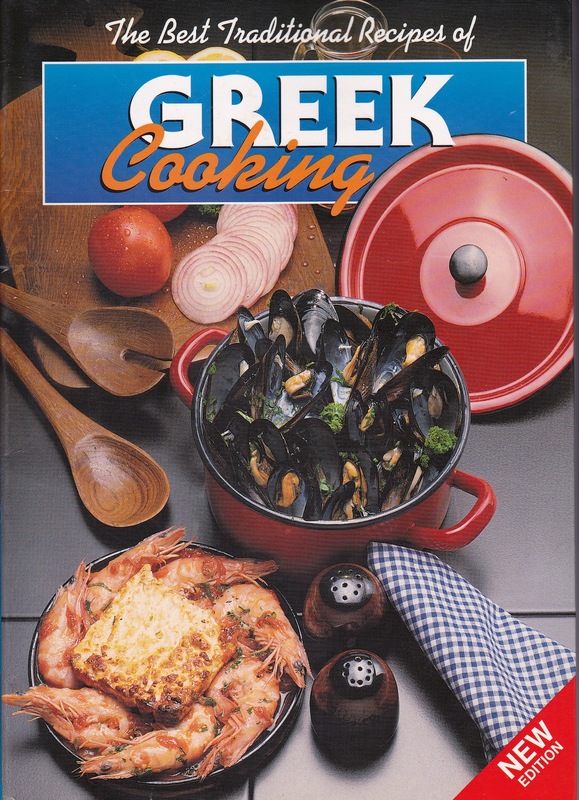 Yes, the cookbook included a picture of spanakotyropitákia but not the recipe. I went through the book page-by-page, twice, to make sure. (And of course, there is no index nor glossary for the book either.) So, although I received a great title for today’s post, I was back to looking for my recipe. It wasn’t very long after that I found my old recipe. It was pretty straight-forward — just how complex can a few notes scribbled on a piece of paper be? — and easily adapted to include feta cheese. The result was just what I had in mind. You’ll find these spanakotyropitákia have a pronounced lemon flavor, which I prefer. In fact, I’ve often been served spanakópita with a lemon slice/wedge as garnish. If, however, you’re unsure about the lemon flavoring, begin by adding the zest of a half-lemon to the spinach mixture. Taste it and let that determine whether to add the rest of the lemon’s zest. Use that tasting to also decide whether more dill is needed and if you want to add more feta. In short, taste the filling and let your palate be your guide as you make this recipe your own. This all sounds well and good but what if you want more? You know. You can’t put your finger on it but you just crave more. Well, my advice is to check out Tanya’s recipe for Salmon Spanakópita. The name says it all. Remove any large, thick stems from the spinach and coarsely chop the leaves. Over med-high heat in a large, non-stick frying pan, heat the olive oil and sauté the onion until translucent, about 5 to 8 minutes. Add the spinach, season with salt & pepper, and sauté, turning the leaves frequently, until cooked. Remove from heat. Once cooled, place the pan’s contents in a clean kitchen towel and wring out as much liquid as possible. 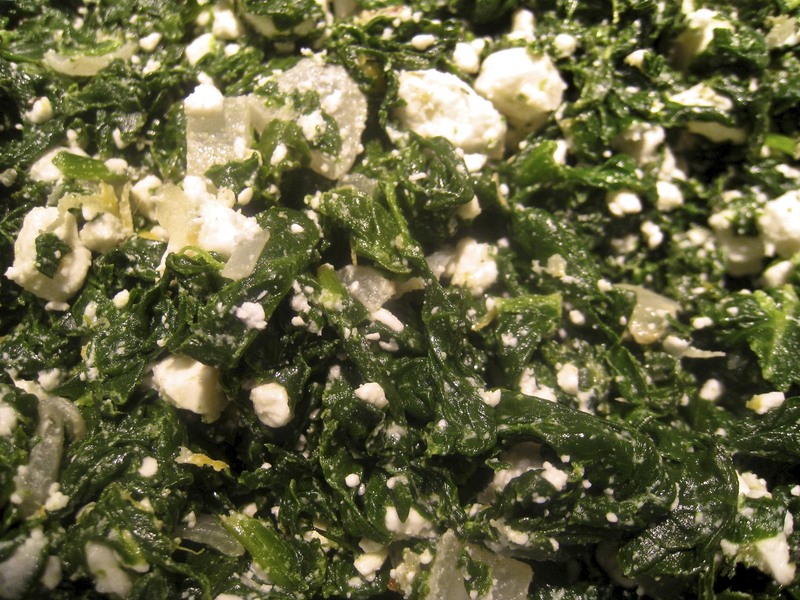 Place semi-dried spinach into a large bowl, add feta, zest, and dill. Mix thoroughly. Taste and adjust seasoning, if necessary. Cover and refrigerate until ready for use. This may be done a day or two in advance. When ready to proceed, add an egg to the spinach and mix until well combined. 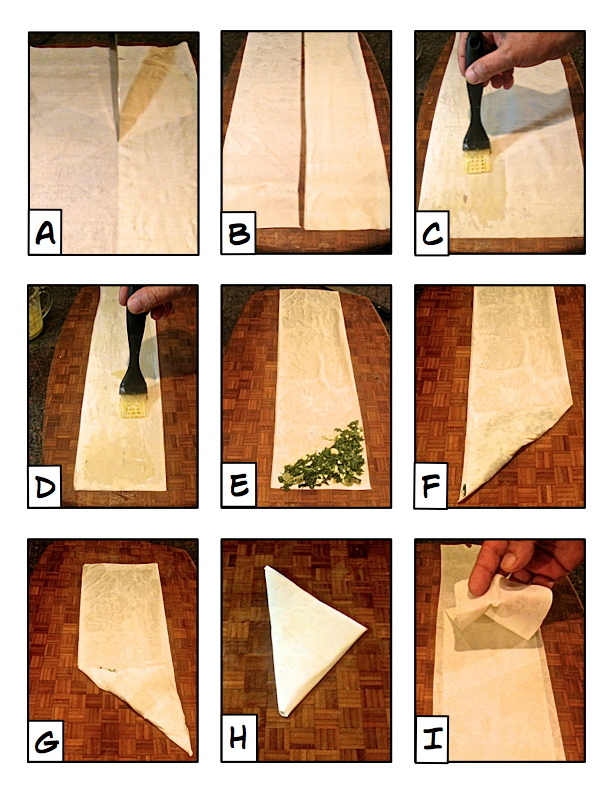 Open and unfold a package of phyllo dough, remove one sheet, and cover the remaining sheets with a damp kitchen towel. Fold the triangle up and over to the side again, and do this repeatedly, as if folding a flag. (G) When you’ve reached the end, place the pie, seam-side down on a baking sheet (H), and repeat the process with a new phyllo sheet. After you’ve finished your 2nd pie, you will have two strips that resulted from trimming the previous two dough sheets. Lay one flat, brush it with butter, and then lay the 2nd on top of it. (I) Repeat steps 10 & 11 above. Once all of your triangles are filled and folded, you can either bake or freeze them. To bake: pre-heat oven to 375˚F (190˚C) . Brush each triangle with melted butter, place seam-side down on a baking sheet, and bake until golden brown, about 15 minutes. To freeze: brush both sides of each triangle with butter, place them in a single layer on a baking sheet, place the sheet in the freezer overnight, and then store for later use. To cook, follow baking instructions but allow an additional 10 minutes to bake. 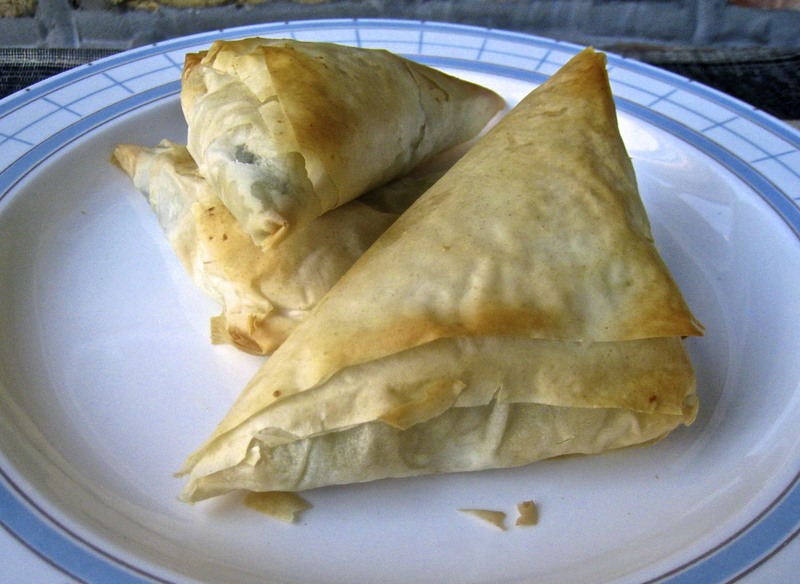 Work as quickly as possible when using phyllo dough. If the sheet dries. it will become unusable. Be sure to keep the rest covered with a damp kitchen towel until needed. As I learned during my recent trip, phyllo comes in different sized sheets. As a result, you may not need to trim off a third of each sheet as shown above. Just folding it in half may suffice. By varying the width of the dough strips, you can change the size of the pies and, therefore, their intended use. Larger pies could be considered part of a light lunch, the perfect starter, or an unusual side. Smaller pies make great appetizers and could even be served as one of many snacks on game-day. I returned home this afternoon bearing Zia’s greetings to you all. Normally, when I’m with her, I show her a number of your blogs — but not this time. For some unknown reason, internet service in her area was even more abysmal than usual. Pictures wouldn’t download and even the simplest of tasks — hitting the “like” button — weren’t possible. This just means that there’ll be more for me to show her next time — and I’ve got dozens of your posts from the past week to read in the meantime. As I’ve mentioned to a few of you, I’ve had a devil of a time finding “baby” artichokes here in Chicago. Sure, I can get the goliaths year-round and, about this time of the year, the stores have some that are at about half that size. The truly small artichokes, however, the ones with no choke, have been impossible to find and it’s not for lack of trying. I routinely shop at 4 different groceries, 2 ethnic markets, and 2 additional fruit/vegetable markets. Whether I’m searching too late/early in the season or I’m living in a heretofore unknown baby artichoke-free zone, it’s been well over 10 years since the green beauties have graced my table — until now. Recently, my vegetarian friend, Cynthia, and I decided to head West to the hinterlands. We’d both heard tales of an Italian market “out there” but never ventured to find out for ourselves. Not much more than a half-hour later, we were there and what a store! First off, the place was huge, easily the largest Italian market that I’ve ever seen. They had everything from antipasti to zuppe, and very often several choices for everything in between. The best surprise, though, was found in the produce department. There, at the end of one of the aisles, was not 1 but 2 displays of artichokes and, much to my delight, one of them was nothing but small artichokes. To say I was happy is a gross understatement. So, with Cynthia perusing the rest of the fruits and vegetables, I got to work selecting only the smallest of the small artichokes. I didn’t care how long it took but I was going to find them. About 10 minutes later, I had amassed some 5 pounds of the edible thistles, all about the size of a goose egg. We soon finished our shopping and snacked on mini-conolli as we drove back to civilization. The next morning, I couldn’t wait to get started preparing my find. 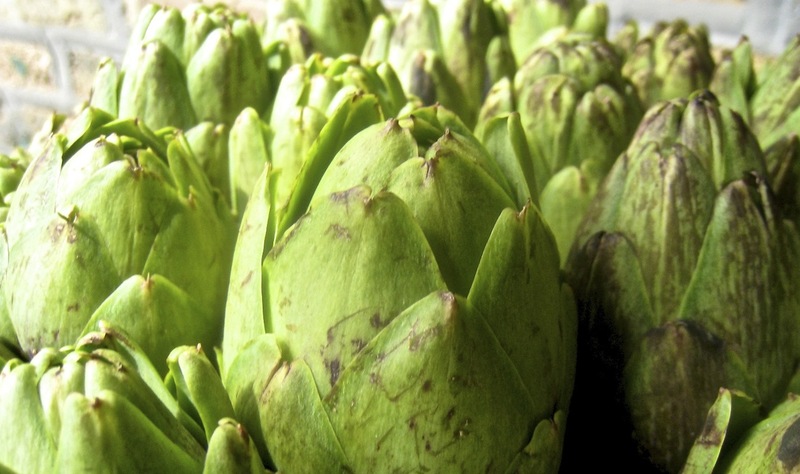 Just like when preparing the goliaths, use a sharp knife to chop off the top of each artichoke. I usually chop just above the tips of the largest outer leaves. Next, peel off a couple of layers of the tough, outermost leaves, revealing the vegetable’s soft inner heart. Using a paring knife, peel the base and stalk of each artichoke and, depending on the size, cut it in half or quarters. Being so small, there is no choke to remove and be sure to save as much of the stem as possible. When finished with each, immediately rub the sections with a halved lemon and place in acidulated water. (Take a large bowl of cold water and add to it the juice of 2 lemons, as well as the lemons themselves.) This “bath” will prevent the vegetable from discoloring due to oxidation. Continue until all the artichokes have been cleaned and trimmed. Next bring a large pot of salted water to boil, add all the trimmed artichokes, and, when the water returns to the boil, leave them to blanch for about 3 minutes. 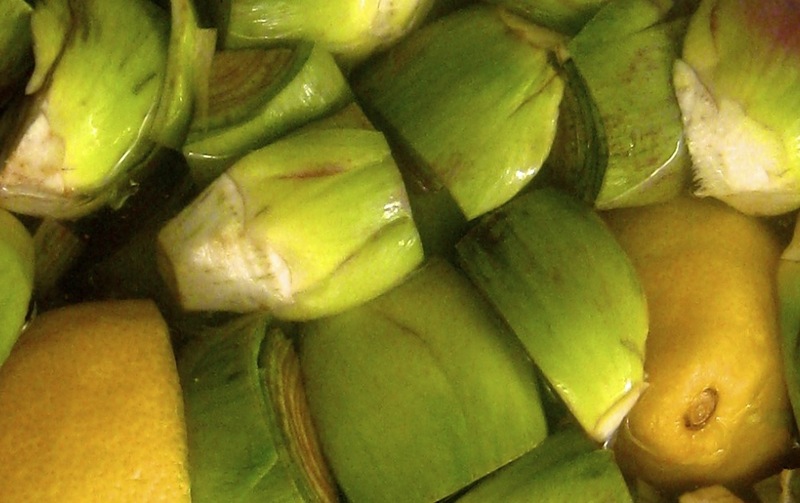 Drain them and immediately place the blanched sections into a bowl of ice water to halt the cooking process. Once chilled, removed them from the water, pat them dry, and they are now ready for use. In my case, having bought 5 pounds of the green gems, that meant the freezer for most of them. Small amounts, destined for pasta or pizza, were individually bagged, as were larger quantities which would be prepared as side dishes in the near future. Once labelled, the bags were placed in the freezer. So, with a treasure of cleaned and trimmed baby artichokes stashed away, what are you going to do with them? Well — and this is where the due modi come into play — I’ve got 2 of Mom’s recipes to share today. Mom didn’t prepare baby artichokes like this very often but, when she did, they certainly didn’t linger long on the serving platter. I think you’ll find the same will hold true today, no matter how you serve them: as a side, an appetizer, or snack on game day. And if you’re working with previously trimmed and blanched artichokes, they’re a snap to prepare. Whether using freshly blanched or just thawed, pat the artichokes dry as best you can. 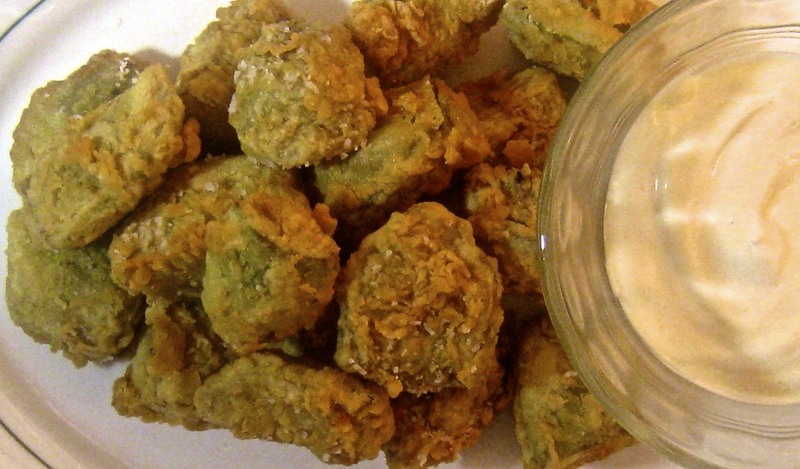 Use standard breading methods to coat the artichokes. Since I prefer a thin coating on these, I do not use bread crumbs. Instead, I’ll coat the artichoke pieces in seasoned flour (paprika & onion powder) first before dipping them in an egg wash that’s been seasoned with salt & pepper. Then it’s back into flour again before deep frying in vegetable oil that’s been heated from 350˚ to 360˚ F. Since the baby artichokes were previously blanched, they won’t need to cook for a long time. When the coating is golden brown, they’re done. Remove them to drain on paper towels, season with salt, and serve. Although fine just as they are, I’ll sometimes serve them with lemon wedges and/or a simple aioli of mayonnaise, lemon juice, and a little grated garlic. If possible, prepare the aioli a few hours before serving to give the flavors a chance to blend. Mom most often prepared these artichokes as she did many vegetables. (See my Vegetables/Verdura posting.) If using fresh artichokes, trim and blanch as indicated above. If cleaned but frozen, allow to defrost before use. In a frying pan over medium heat, add a couple tbsp of olive oil. Once heated, add some chopped garlic, wait a minute, and then add the artichokes. Wait another 2 minutes and then add a little tomato paste or chopped tomato, “For color,” as Mom would say. Add a splash of dry white wine, season with salt & pepper, and continue to sauté until the wine is all but gone and the artichokes are cooked to your liking. Serve immediately, garnished with fresh parsley. This is all well and good, so long as you can get baby artichokes. But what if you can’t? Both of these dishes can be prepared with artichokes of any size. Just be aware that larger-sized artichokes have developed an inedible “choke.” It’s a fibrous mass found at the base of the bulb and it must be removed. Once you’ve trimmed and halved an artichoke, use a paring knife or teaspoon to scoop out the fibrous mass. Once the choke has been removed and depending upon how large the artichoke is, you may need to cut each half into halves or thirds before proceeding. As you may have guessed, because of their size, these artichoke pieces should be blanched a few minutes longer than the “babies” were and will require longer cooking times, too. Personally, I prefer to stuff and roast the larger artichokes, leaving the sautéing and deep frying for the more tender babies. 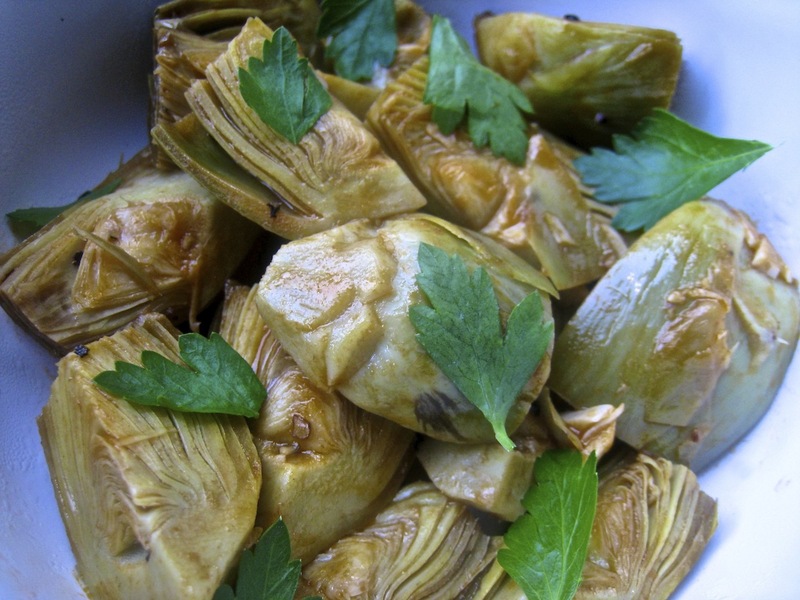 Today I shared Mom’s favorite recipes for preparing baby artichokes. Next week I’ll share my Pasta Primavera recipe that features baby artichokes, of course, as well as a couple of other Springtime treats. As I’ve mentioned in my last posts, I’m on a campaign to vary Thanksgiving dinners at my place. I do realize, however, that there is only so much leeway to be had. I wouldn’t swap out the turkey for some other fowl, nor would I replace the stuffing with wild rice, and I certainly wouldn’t serve dinner without preparing mashed potatoes — although serving the potatoes has proven to be a bit problematic. Over the years, I’ve tried a number of mashed potato recipes that, although not bad, were just not good enough to be the “go to” recipe for Thanksgiving. Then, about 6 years ago, I watched Alton Brown prepare these potatoes and it was love at first sight. Now this is the only way I make mashed potatoes and my dinner guests are very pleased that I do. Before detailing the recipe, I feel the need to explain my statement about serving potatoes being problematic. (I apologize to those who may have already read a brief recounting of this story in a previous post’s comments.) The apartment I rented before buying my home was what they called “vintage.” The building itself contained three, 3 bedroom apartments, was Victorian in style, and each contained the original unpainted, woodwork, beamed ceilings, original leather wainscoting in the dining rooms, and the original built-in china hutch in each dining room. Yes, the living rooms and dining rooms were really quite beautiful but, walk down the hall and you entered a kitchen nightmare. Saying that they wanted to “keep it vintage” — we tenants quickly learned that the landlords were just plain cheap — none of the kitchens had any counter space whatsoever. 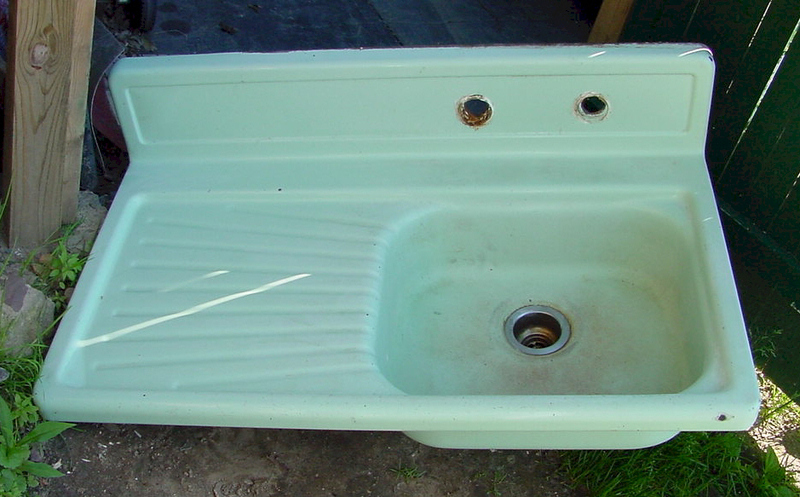 Each had a sink like the one pictured below and that drain board was the only “counter” to be found. There were only 2 small cupboards, as well, and they were located above the sink. To be fair, there was an adjoining pantry but it was of little use when pulling something out of the oven, unloading groceries or, I dunno, just pouring a cup of coffee in the morning. I moved into that apartment in August and by the time Thanksgiving rolled around, I’d only found one table that I liked for the kitchen. It was an old kitchen work table with a flour bin drawer and underneath was enough space for my pots & pans. Best of all, it offered a tabletop surface that I so desperately needed. That first Thanksgiving was going swimmingly. My friends had already finished their pasta and were working on their salads. I was in the kitchen getting everything assembled for the final push. While clearing the salad plates, rather uncharacteristically, I actually remembered the rolls were in the oven and, with counter space at a premium, placed the hot baking sheet full of toasty rolls atop the bowl of mashed potatoes. I served the dinner and, by all accounts, it was very well-received. In fact, near the end of the main course, one friend mentioned that he didn’t even mind not having mashed potatoes. Huh? Sure enough, my potatoes were still in the kitchen, on the table with a now empty baking sheet covering them. Laughing, I served them, more to prove that I did make them than for any other reason. To their credit, my guests all did have some, although I wouldn’t say that they were especially thrilled to see mashed potatoes served so late in the game. Cheesecake, yes. Mashed potatoes, no. That recipe was destined to be forgotten because once I saw today’s recipe prepared, I never made any other kind. It is certainly my kind of dish, easy to make with very little room for error — so long as you don’t lose ’em in the kitchen. All you do is steep some garlic in heavy cream and combine that cream with some boiled potatoes. Add a little cheese & butter, and the result is a dish of mashed potatoes with a delicious garlic flavor throughout. Just be aware that when you add the last of the cream, it very well may look like there’s been too much added. Never fear. Just give it a good stir and let it rest. Within minutes, the cream is absorbed and you’ll end up with a beautiful dish of creamy, garlic mashed potatoes. Peel and evenly chop potatoes, place in a saucepan, cover with cold water, bring to a boil over med-high heat, add the salt, and then lower to a simmer. Continue to simmer potatoes until fork-tender, about 20 minutes. Remove from heat, strain the potatoes, and return to the now empty saucepan to sit for 5 minutes, allowing them to dry more fully. Meanwhile, place garlic and cream in a small saucepan and heat over medium heat until simmering. Remove from heat and set aside until needed. Just before use, pour the cream mixture through a sieve to strain out and discard the garlic. Once the potatoes have been boiled, drained, and rested, begin mashing them. Add some of the cream to make them easier to mash. Once mashed to your liking, add the remainder of the cream and mix well before adding the cheese and butter. Mix to combine. 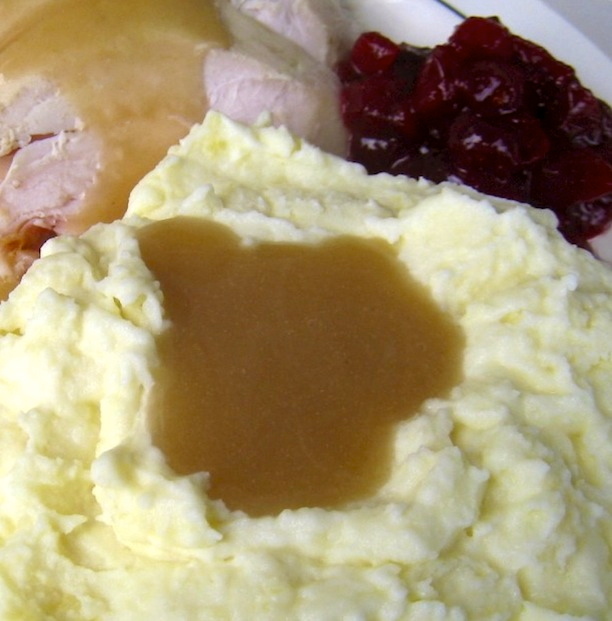 Let the mashed potatoes rest a few minutes on your stove top while the remaining cream and butter is fully absorbed. Mix well and serve. Alton likes to leave his garlic in the cream and mash it along with the potatoes. I prefer to strain it out prior to mashing. I feel that I can better control the level of garlic flavor in the final dish and, also, ensure that no one is served a chunk of garlic masquerading as a potato lump. Whether or not you strain the cream, remember that the longer you allow the garlic to steep, the more garlic flavor will be infused into the cream. If you look at Alton’s recipe, you may notice that he doesn’t add any butter. No butter in mashed potatoes? Perish the thought! I’ve corrected his oversight in my version of the recipe. This will be my last post before the Holiday, so, I’d like to wish a happy Thanksgiving to you and all whom you hold dear. And for those not celebrating the Holiday, have a great day and an even better weekend. Continuing my quest to bring a little variety to my Thanksgiving dinner, the year following the introduction of creamed corn, I served a medley of root vegetables. This dish was selected because it met 2 important criteria required of any dish to be deemed worthy of a spot on my roster of Thanksgiving side dishes. First, and most importantly, any new addition must be tasty — and this one was surprisingly delicious. I say surprisingly because I’d never sampled rutabaga prior to my finding this recipe on the web during yet another sleepless night. I added parsnips to the dish after enjoying them for the first time at a dinner prepared by the Neighbor Lady of my Trusty Traveling Companion. While some might find that surprising, in retrospect, it’s totally understandable why rutabaga and parsnip never made an appearance upon our dining table when I was growing up. Considering the cornucopia of vegetables that graced our table, there just wasn’t any room for these 2 on the menu. Add one more vegetable and Mom may have had to cut a pasta dish out of her repertoire. Cut a pasta? I can feel my heart racing! The second requirement is that the potential dish be easy to prepare — and special consideration is given if the dish can be cooked on the stove top. When I’m in the final stages of getting the dinner to the table, the last thing I need is to be babysitting a couple of side dishes. I’ve got potatoes to rice/smash, gravy to make, a pasta course to serve, salads to prepare, and rolls to forget and burn in the oven. And we mustn’t forget a bird to carve and dishes to clear. Tending to some needy side dish(es) just won’t do and the time I spend trying to find room in the oven for it could be better spent trying to find the cocktail I left somewhere out among my guests. This dish is perfect in this regard. First off, you can peel and chop the vegetables well before your guests arrive. In fact, I’ll often do the prep work the night before and seal the chopped veggies in a plastic bag to be stored in the fridge. Taking but 20 minutes to cook, if that, once you get everything into the pan, you can pretty much leave it until it’s ready to be served. It doesn’t get much easier than that and you may find that you even have time to lose a 2nd cocktail. Melt the butter in a skillet with a cover over med-high heat. Add garlic, onion, carrots, parsnips, and rutabaga. Season with salt & pepper and sauté for 5 minutes, stirring occasionally. Add stock, bring to a boil, reduce to simmer, and cover. Cook vegetables until fork tender, about 15 minutes. Season with salt & pepper, to taste. Besides being tasty and easy to prepare, this dish is perfect for those who color coördinate their Thanksgiving dinner. By offering 4 distinct colors in one recipe (pale yellow, orange, and white, not to mention the red onion), this dish single-handedly provides you with many of the colors of the Thanksgiving palette. And if you’re worried that the parsnips will bring too much white to your table, just replace your mashed russets with a batch of Jed’s purple potatoes and you’ll be fine. Anyone who has cooked Thanksgiving dinner a few years in succession will understand my problem. So will anyone that dines at the same Thanksgiving table for several years. The problem is boredom, for lack of a better word. My Thanksgiving dinner’s main course and all the fixins didn’t vary from year to year. Sure, I served a different pasta for the primo piatto, I varied the salad course, desserts came and went, but the turkey & fixins remained pretty much unchanged. So, about 5 years ago, I decided to mix things up a bit. Beginning that year, and every year thereafter, I would switch out a dish for a new one. 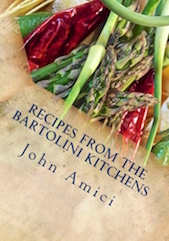 A friend — and Bartolini kitchens taste tester — is from the South. I asked if he had a favorite dish that his Mom made at Thanksgiving. He loved her corn and I asked for the recipe. Well, as luck would have it, something came up and my friend couldn’t make it to my place for Thanksgiving dinner but his Mom’s corn sure did. It was such a hit that it has become a mainstay of my Thanksgiving dinners ever since. In fact, at one dinner I casually mentioned that I intended to switch the corn out for something else the following year. My guests politely suggested I leave well enough alone. Ironic isn’t it? I prepare a new dish in an effort to “mix things up a bit” and it is so well-received that now, 5 years later, it has become one of the dishes it was meant to replace. Anyway, even though the corn may have stayed, undaunted I’ve continued to introduce a new dish every year since, a couple of which will be shared in future posts. In a medium sauce pan or skillet over medium heat, sauté the shallot and bell pepper in half of the butter for 3 minutes. Add the half-and-half, sugar, corn, salt, and pepper. Mix well and bring to a boil. Meanwhile make a roux by combining the flour with the remaining butter over medium heat. Stir to combine and continue cooking until the roux is a pale yellow. Add the roux to the corn mixture and stir constantly until it thickens. Continue cooking and stirring for an additional minute and serve. If I prepare this dish in August or September, the height of our corn season here in Illinois/Michigan, I’ll use only a 1/4 cup of sugar because the corn and its juices will be very sweet. For much of the rest of the year, however, unless I’m certain the corn is really good, I’ll use frozen corn. Unfortunately, frozen corn has no liquids — “liquor,” if you will. To make up for the lack of liquor, I’ll take 1 to 2 cups of the corn and pulse it a few times in my food processor. This will help the final dish to look like the corn has been cut from the cob by hand. To make up for the sweetness lost, I’ll increase the sugar from 1/4 cup to 1/3 cup. 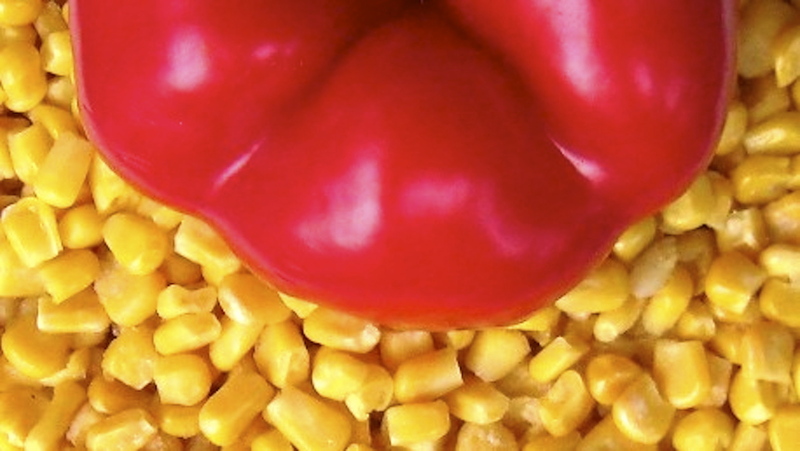 The resulting dish looks and tastes like it was made from fresh corn. I remove the corn kernels in one of two ways, depending upon the recipe. For Zia’s Corn Relish, I’ll use an electric knife to slice the kernels off of the cob. I find that the kernels remain whole with very little liquor created, just perfect for corn relish. For this recipe, I’ll use a large chef’s knife to remove the kernels. This method is not nearly as “kind” to the ear of corn, resulting in kernels that are somewhat chopped and a good amount of that sweet corn liquor. Max "picked" the smaller one about 1 week too soon. We suspect the larger was "trimmed" by a lawn mower when it was but a few days old. 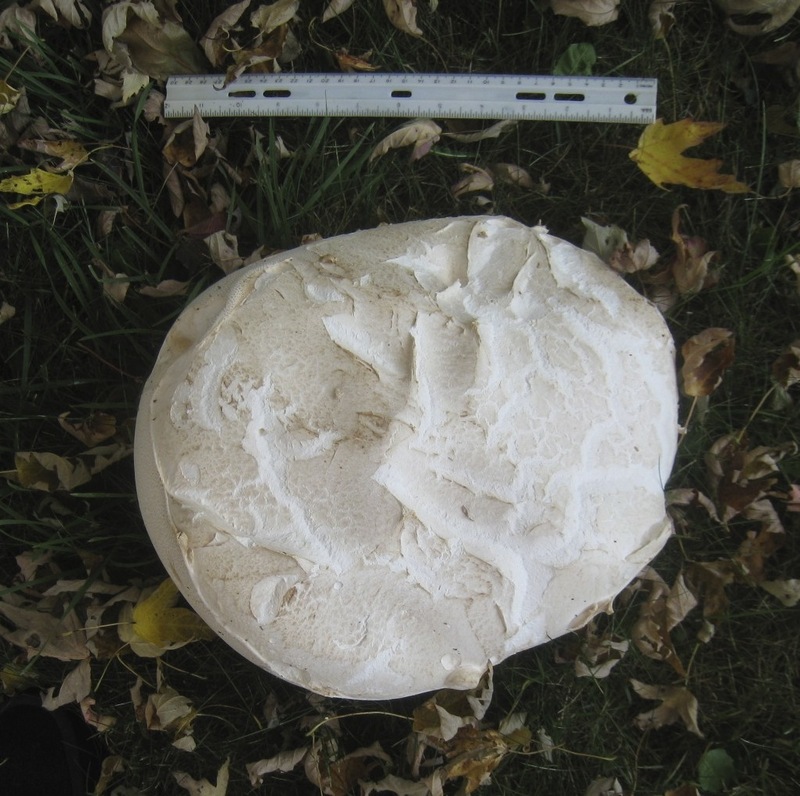 Each year, usually in the first weeks of October, 1 to 3 egg-sized fungi appear in the lawn by Zia’s garage. 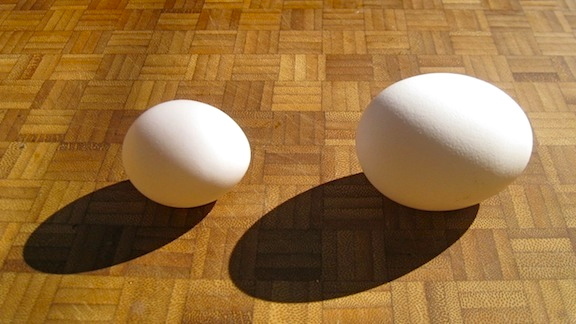 In less than 2 weeks, these “eggs” will grow to be football-sized — and therein lies the quandary: when to pick them. Grab them too soon and you may be cheating yourself out of a few days’ growth. Picked too late and you’ll have no choice but to throw it away, hopefully back where you found it so its spores will produce next year’s crop. So, once you’ve decided it’s harvest time, what’s next? That’s easy enough. Pick them and, just before cooking, trim away the outer peel to reveal a flesh that’s relatively firm and pure white, like that of a white button mushroom cap — on steroids! If it is even the palest shade of green, yellow, or brown, discard the puffball because it has “turned.” Your best bet is to cook them as soon after harvesting as possible. 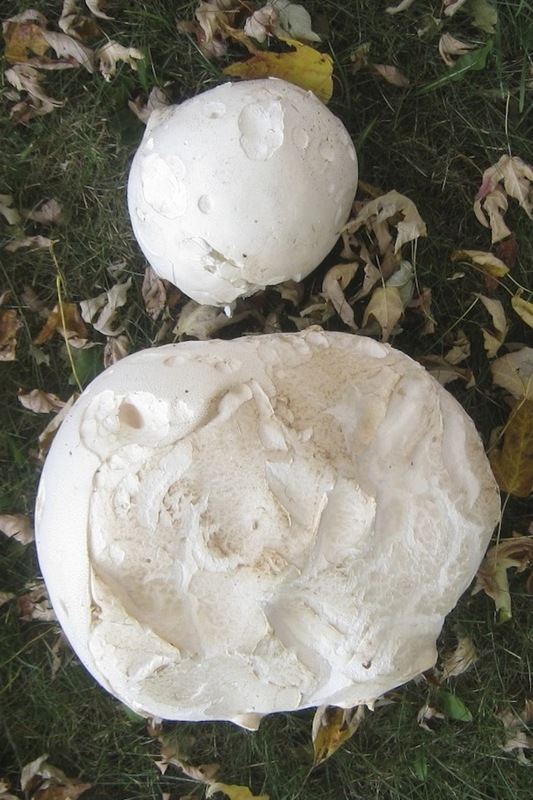 As mentioned earlier, puffballs have a very mild, mushroom-like taste and this limits the ways they can be cooked. One year, after a crop that yielded 3 huge puffballs, I brought one home and used part of it in a tomato sauce. Big mistake. Being so mild tasting, one could easily have mistaken the puffball cubes for tofu — not exactly the result I had in mind. Since then, I’ve restricted my use of them to 4 recipes. To begin with, if I cannot cook it within 2 days of picking, I’ll chop the puffball into cubes and lightly sauté them in butter. I place the partially cooked cubes on sheet pans and into my freezer. When fully frozen, I place the cubes in bags to be stored for later use in omelets. When he brought the first one home, Dad suggested that Mom cut it into cubes before breading and frying them. So, she cubed it, floured the cubes, dipped them into an egg wash, and then coated them with seasoned bread crumbs before deep frying. 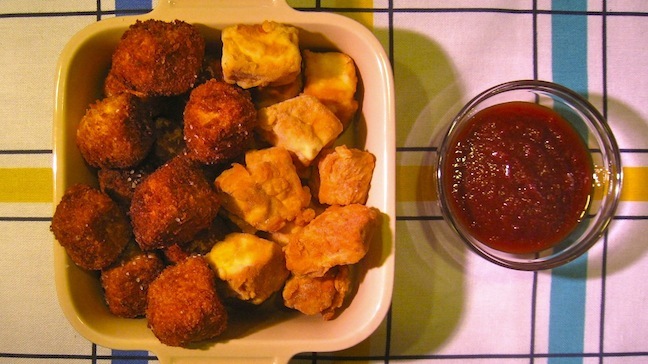 Pictured above, are cubes prepared in this way using Panko bread crumbs. Oddly enough, as Zia mentioned, they’ll remind you of toasted marshmallows, albeit a little mushroom-y. Also pictured are puffball cubes prepared with a 2nd coating of seasoned flour rather than bread crumbs. Although good, I much prefer the Panko-coated. By the way, the dipping sauce pictured is homemade ketchup that was inspired by Tanya’s Up The Mountain Spicy Tomato Ketchup over at her Chica Andaluza blog. Her sauce is fantastic and better, by far, than any ketchup that I’ve ever tasted. The 4th and final preparation is a method I found at the Mycological Society of San Francisco website. If you’ve a mushroom-related question, this is a good place to start looking for an answer. Their recipe, Parmesan Puffballs, involves coating slices of puffball with grated parmesan cheese instead of breadcrumbs or flour. Fried in a mixture of butter and olive oil, these are a tasty alternative to the other methods. Truth be told, however, the parmesan cheese is the real star of this dish; the puffball being overwhelmed by the flavor of fried cheese. 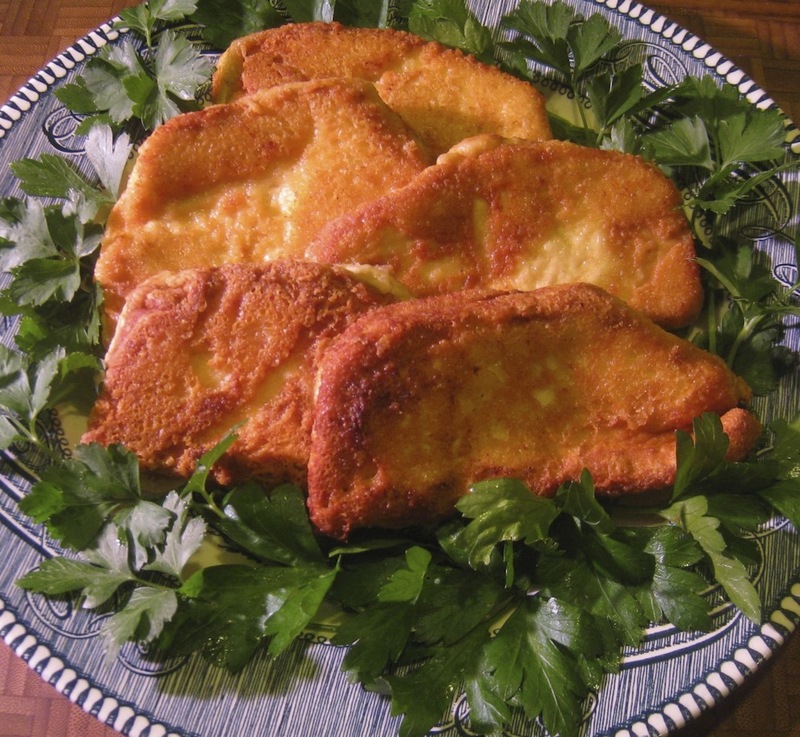 Although not quite the dish one might expect, any excuse to eat fried cheese is all right in my book. In the years since Dad brought home that first puffball, my family has enjoyed them many times. Never once has anyone experienced any discomfort or problem after eating them. Still, as is the case with any mushroom or fungus, if in doubt, do not eat. So, you think you had a rough night? No, those aren’t puffballs. The night before we (Lucy, Max, and I) left for Michigan, Lucy laid an egg, pictured above to the left of a “large” chicken egg. 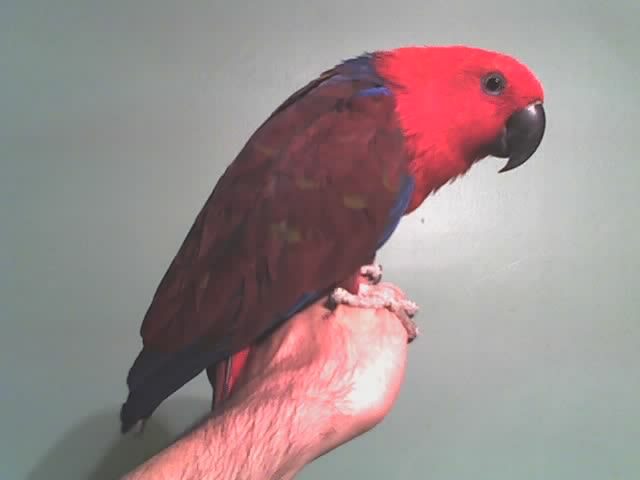 That was 2 weeks ago and she normally lays a clutch of 2 eggs over the course of 2 to 3 days. The trip obviously affected her delivery schedule but, the way she’s acting, I expect to find this egg’s Irish twin in the corner of her cage within the next day or 2.